Recovery (alias, the never-ending project) has another set of legs (and they are very exciting), and the team – Nat Cursio, Shannon Bott, Pete Brundle, Ben Cobham (Bluebottle), Ben Cisterne and Byron Scullin – are currently inhabiting the rehearsal space at Napier St in Melbourne. I’m doing a bit of ‘directing from a distance’ and we’ll pick up some more time in March 2012. A première is not far off (but I’ve written this before). In late August I traveled to Findhorn, Scotland to participate in Deborah Hay’s Solo Performance Commissioning Project. I’ve wanted to participate in the SPCP for some time, and have long been inspired by artists such as Ros Warby, Rachel Krische, Atlanta Eke and Joe Moran who have worked with Deborah. Deborah developed a solo I think not which she taught us, and since then I’ve been practicing it daily in order to première the work next year. 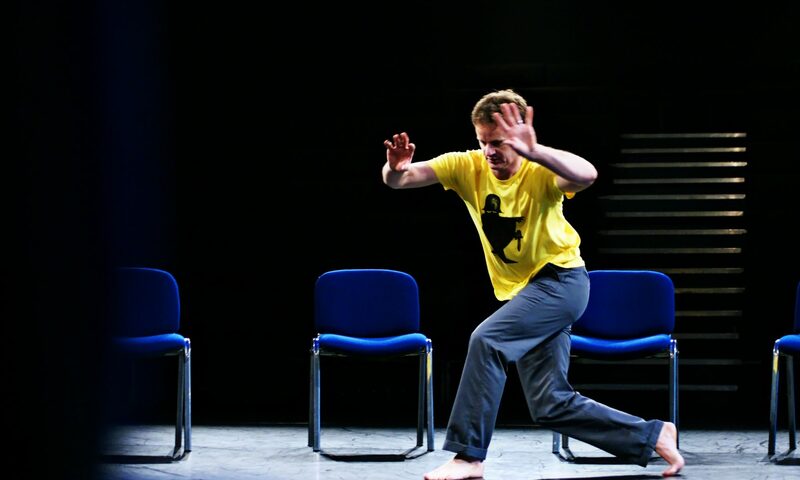 At this stage I’ll be showing my adaptation of Deborah’s choreography in Leicester, UK on 8 March 2012, and then again in Auckland, NZ in the week leading up to Good Friday (day to be confirmed). I’ll also be presenting the work in London sometime in late February, and will look to show it off (never could words be more wrong) in Melbourne when I am there in the Antipodean Autumn. Details and research blog at skellis.net/spcp. Thanks again to everyone who commissioned the project – my singing may mean you wished you hadn’t. Lastly, I’m in Melbourne and Auckland in March and April for a number of projects and workshops, and hope to catch up with my Australian and Kiwi dancing friends. COMMA is a dynamic series of commissions enabling artists to experiment and expand their practice in relation to the particular nature of Bloomberg SPACE. For COMMA40, ground-breaking artists from The Place, will populate the gallery with creative research, evolving installations and impromptu performances. I follow the blogs and social networking updates of a number of teachers around the world. They inspire me and and ask current and difficult questions about teaching and learning, often whilst willingly sharing ideas for working with students. Often these ideas are about attempting to make teaching and learning environments that give students the best possible chances of developing their voices – creative spaces that inspire, challenge, and help us to question our assumptions about the things we think we understand, and the things we might like to understand. And yet Shelley’s direct and very personal writing about her experiences of working with the students in Moose Jaw (just wanted to write that again) is provocative, inspiring and filled with possibilities for working with people who are curious about learning and ideas.